Johnny Pistolseed is a mysterious image technician who saves the life of rogue policemen: he dubs guns into the hands of victims in cop-cam videos. He appears untouchable until a crisis of justice arises in Ak-wy-yeth, Indiana when a deputy kills Billy Redcrow. Billy is a teen-aged American Indian and a friend of fifteen-year-old Culture Duboreaux. Culture is a precocious Hispanic genius who uses her intellect and persuasive powers to mobilize a team effort to prove the gun in the body-cam video had been dubbed. Culture’s mother Andra, owns the junkyard where the artist, known as Attila, does his work. She also helps Mary Jean Kruegerrand try to turn their county into a self-governing democracy, a kind of atonement for being part of the family who tyrannized Kruegerrand County and central Indiana for several generations. The artist Attila’s contact with whistle-blowers and his paintings attacking America’s gun culture are a natural asset to Culture’s mission, and all the fascinating characters of Kaiser's two previous novels strut, stumble, bluster and bicker their way toward another surprise ending. The author’s screwy humor and sharp sarcasm unfolds like a Swiss army knife as the mission penetrates the greatest secret of America’s Blue Mafia. 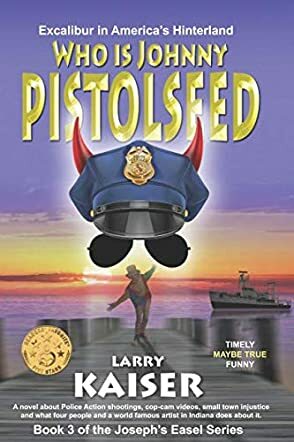 Who Is Johnny Pistolseed by Larry Kaiser is an engaging crime story with exceptional characters. In the town of Ak-wy-yeth, Indiana, a deputy sheriff shoots and kills Billy Redcrow, a teenager and a Native American who happens to be a friend of fifteen-year-old Culture Duboreaux. Culture is a rare breed, a very intelligent girl with a keen sense of fair play. While Johnny Pistolseed can help cops get away with crime by 'dubbing' guns into the hands of dead victims, Culture is determined to prove that the gun in the body-cam video is dubbed and she has mobilized an unusual team to back her up. Can they unravel the truth and get justice? I was gripped by the opening lines of the story, lines that immerses the reader in the soul of a village, an element of the setting that will accompany readers as they follow the characters: “The beachside village of Oceanside was feeling it early, the Santa Anna winds seeming to hold a death grudge against anything green in Southern California.” From this line I already felt like I knew this author or would like to listen to him. He has an interesting way of telling a story, always exciting the curiosity of the reader, plunging the reader, one layer at a time, into a maze of action that will keep them reading for hours. The prose is exquisitely good and the humor is the very foundation of this tale. It is unique and it fills every page of the narrative. Readers will love the protagonist and her commitment to unveiling the truth. She is stubborn, determined, and matches her stubbornness with intelligence. Who Is Johnny Pistolseed is a novel that will put readers on the edge of their seats. Character-driven and beautifully plotted, it is an entertaining read.